terminator X software is a realtime audio synthesizer that allows you to "scratch" on digitally sampled audio data (*.wav, *.au, *.mp3, etc.) to sound like a hip-hop DJ's on vinyl records. 2D-Scratching: terminatorX now comes with a resonating lowpass filter, where the cutoff frequency can be modified in realtime while scratching. 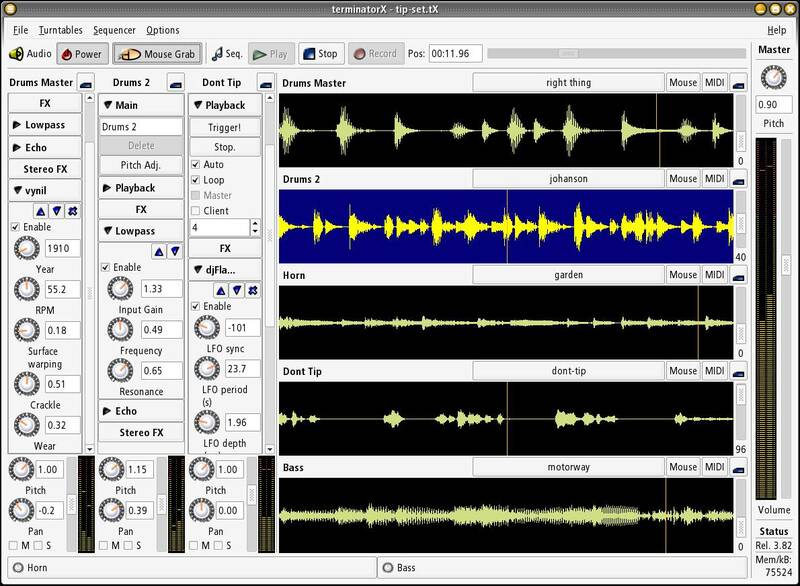 the position of the audio control scrollbars is now saved within set files and restored upon loading. fixed a liblrdf related issue resulting in use of previously free'd memory. rendered a new knob with the wonderful povray - all images are now distrbuted in gdk-pixbuf-csource'd form in the src/icons directory. added an extra "File/Load Audio File" menu item as new users would always try to load an audio file via "File/Open". fixed compilation issues with g++ >= 3.4. Posted by tecsatan on Fri, 03/09/2012 - 11:26. Posted by Pete on Wed, 03/03/2004 - 07:02. OF PUBLIC ENEMYS DJ TERMINATOR X! Does he know you named this program after him? Anyhow it sounds like a kool idea! Posted by janni on Sat, 10/06/2001 - 02:03.
wie kann man das downloaden! Posted by DJ Orbitx on Mon, 07/30/2001 - 17:35. This only works on linux you guys, if you have linux it should be obvious enough how to install it. Posted by myself on Mon, 11/17/2003 - 15:56.
: This only works on linux you guys, if you have linux it should be obvious enough how to install it. NO WAY IT OBVIOUS!!!! IT NEEDS A THOUSAND PACKAGES AND DEPENDENCIES!!!!! How DO I Install it huh?? Posted by DJ LKJFKDjfdkfji on Wed, 04/18/2001 - 02:48.
how do i install this thing? someone help? Re: How DO I Install it? Posted by Daniel on Sun, 10/07/2001 - 07:30. Posted by Johnny Five on Thu, 01/27/2000 - 03:35. I unzipped the program and there's a bunch of stuff, but nothing to install.